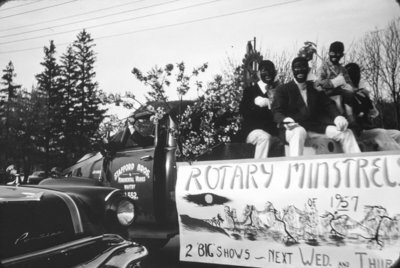 Black and white negative showing members of the Rotary Minstrels in blackface on the Whitby Rotary Club float. The float was part of the parade to celebrate the victories of the Whitby Dunlops hockey team. The original Whitby Dunlops were founded in 1954 when the 1952-53 Oshawa Generals were disbanded after their arena burned down. Some of the players, along with coach and manager, Wren Blair, formed the Oshawa Truckers for the 1953-54 season. In 1954, the Oshawa Truckers relocated to Whitby and were temporarily renamed the Whitby Seniors. The team played out of the Whitby Community Arena and was soon sponsored by the Dunlop Rubber Company. The newly renamed Whitby Dunlops, started their first year as a Senior B team. After winning the league they moved up to the OHA Senior A League. The Dunlops won the Allan Cup in both 1957 and 1959 and won a gold medal at the World Ice Hockey Championships in 1958 at Oslo, Norway. Notable members of the Whitby Dunlops include former Whitby mayor, Bob Attersley, former Toronto Maple Leafs captain Sid Smith, and Harry Sinden. The Whitby Dunlops folded after 1960. They were revived in 2004 by a group of local businessmen and entered the Ontario Hockey Association's Eastern Ontario Senior Hockey League for the 2004–2005 season. The Whitby Dunlops joined Major League Hockey, the top tier for senior men's hockey in Ontario, in 2009. Whitby Dunlops Victory Parade, 1957, Harry Town, Whitby Archives, 21-007-233.